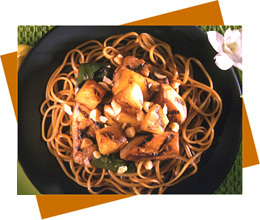 Mix together soy sauce, Splenda, ginger, sesame oil, and Pineapple Syrup. Reserve 1 cup of sauce for the pasta. Pour remaining sauce over the chicken, pineapple, onion, and pepper chunks and marinate for approximately 20 minutes, stirring occasionally. Meanwhile, light grill with mesquite charcoal and allow coals to start. While waiting for grill, cook pasta according to package directions. Drain and toss with remaining sauce and place in large serving dish. Skewer marinated chicken and vegetables and grill until cooked through; turning occasionally. Remove from skewers and arrange over pasta. Sprinkle with macadamia nuts and serve!